Limber Tree Services now offers Plant Health Care! 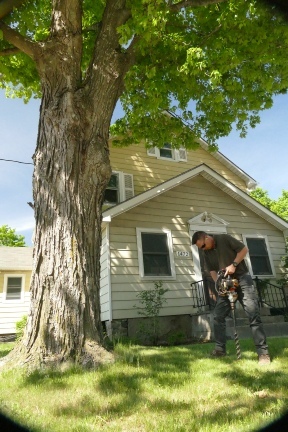 We can help you control populations of invasive insects in your trees as well as apply root feeding. One of our technicians applies deep root feeding. 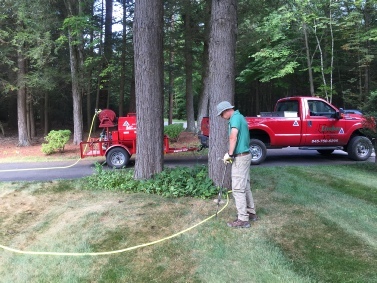 Limber Tree Services Inc. is certified by the State of New York for pesticide application. According to the NYSDEC: Consumers who need the services of a professional pest management company should ask to see a copy of the NYS Pesticide Business Registration and the NYS Certified Applicators Photo Identification Card issued by the Department of Environmental Conservation. Soil injections of nutrients among tree root zones helps to alleviate compaction and allows your trees to absorb more of the naturally available water and nutrients in the soil. The biological product we use is mixed with water and then pressure injected into the soil 2 - 8 inches in depth within the tree’s root zones. Soil injections of mycorrhizae (beneficial fungi) and nutrients both aerates the soil within the root zone and helps establish growing conditions that your tree’s roots need. A regimen of soil injections over several years can make a big difference in the health of your trees and shrubs and improve their ability to withstand drought, bug infestations and disease. Proper mulching around trees aids in both protecting the tree trunks and in establishing proper soil conditions for your trees to thrive in.